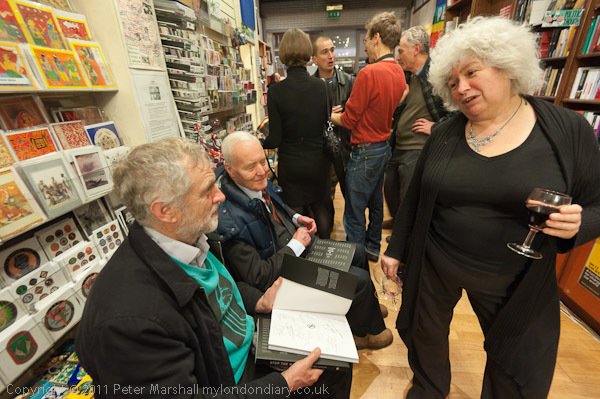 Stop The War held a launch party for their new book, a profusely illustrated graphic history of their 10 year campaign, at Housemans radical bookshop last night. 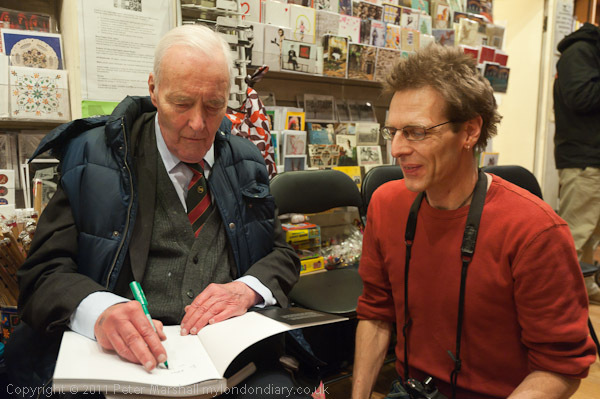 The event was attended by many of the leading figures in the campaign, including Tony Benn who contributed the foreword to the book ‘Stop The War: A Graphic History‘ and made a short speech at the event. 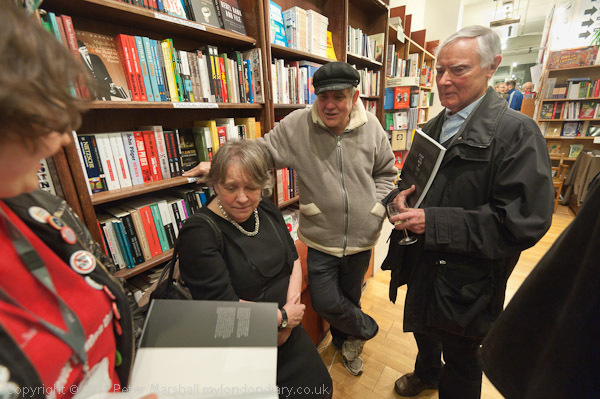 The book should be available now at all good bookshops, as well as direct from Stop the War. 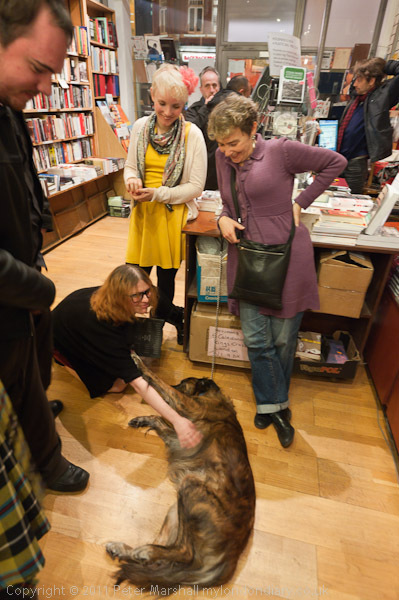 In time I’ll put a few more pictures on line from this event on My London Diary – the site is currently running about a month behind GMT. Perhaps too I’ll post here my own contributions to the book, as well as possibly some of those that in the end didn’t get used. 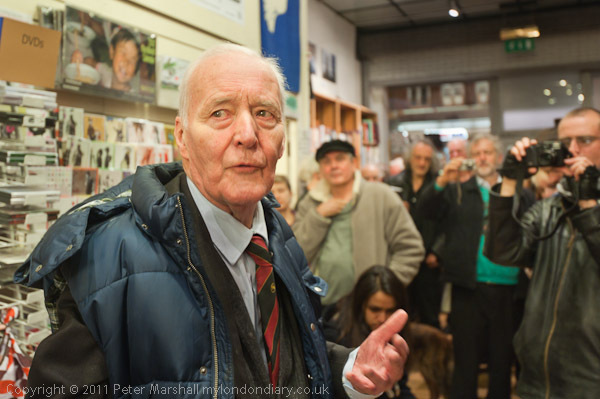 Housemans is a fairly small shop with some narrow areas and at the start it was far too crowded to be worth making pictures, although I found myself standing next to Tony Benn when he made his speech and took a few frames. But most of the rest are from later in the event when numbers had thinned out considerably, apart from some of us photographers making the most of the free wine. I think the wine had slightly affected the D700 too (I had it with me from an earlier event I’d been covering) as rather fewer of the pictures that I took – all with the 16-35mm f4 – were as sharp as usual and the framing lacked the kind of precision that I usually aim for. Many artists and photographers have contributed to the campaign through their work over the years, and have continued that in making their work available for this volume. A central section, ‘The Art of Politics’ includes images by such well-known figures as Banksy and Ralph Steadman, and throughout the book both as illustrations and in many of the photographs we see the work of David Gentleman, whose graphic posters have inspired the movement. The book, produced under the editorial direction of Andrew Burgin, with Marie Gollentz as editor and design by Peter Palasthy is a fine piece of work and should win prizes. There are photographs by around a couple of dozen photographers, including Guy Smallman who responsible for photography research (Ruth Boswell for the art research) with most of the pictures coming from from half a dozen of us, including some fine work by Paul Mattsson and Brian David Stevens as well as Guy himself. Many of the photographers and some of the artists were present at the launch, and several of us took pictures. Fittingly the first section of the book is given over to photography, and after the art section the final part of the work is a ‘Graphic Timeline’ which attempts to list all of the many actions organised by the national movement (of course there were many more local events), illustrating many by posters and photographs, as well as thumbnails giving page numbers of photographs in the initial section. Of course no photographer is ever entirely happy about how their pictures are published, although I was very pleased to have a few of mine included. But editors often prefer the wrong images, insist on cropping them, even take colour images and convert them (sometimes not particularly well) to black and white. The only way that photographers can get work treated exactly as they want it is to publish their own work – which is why I’m so keen on Blurb! And after all I’ve been producing my own ‘graphic history’ of Stop the War, along with other protest movements for over ten years on My London Diary. I was amused when one of the other major photographers told me that he had used my site to identify the particular events where he took some of his pictures in the book. This entry was posted on Saturday, December 10th, 2011 at 01:14 pm and is filed under My Own Work, Photographers, Political Issues. You can follow any responses to this entry through the RSS 2.0 feed. You can leave a response, or trackback from your own site.